The Sunday preceding Holy Easter wants to commemorate the triumphal entry of Jesus into Jerusalem: between two wings of a crowd that stretched the cloaks to form a carpet and joyfully waving palm and olive branches - abundant in the region - made them honor exclaiming "Hosanna to the son of David! Blessed is he who comes in the name of the Lord! The blessing of the palms has been documented since the seventh century and had a development of ceremonies and songs adapted to the increasing importance given to the procession. This is witnessed in Jerusalem since the end of the fourth century and almost immediately was welcomed by the liturgy of Syria and Egypt. The peculiarity of Bordighera dates back to the year 1586 following an incident occurred when Pope Sixtus V decided to erect, in St. Peter's Square, the Egyptian obelisk dedicated by Caligula to Augustus and Tiberius: the lifting ropes were close to the point of break but, in the general silence of the difficult lifting operation, a cry lacerated the square: "Aiga ae corde" given by the sea captain Giovanni Bresca, who assisted in the maneuver. The peremptory suggestion was heard and the strings, suitably wet, contracted allowing the definitive settlement of the obelisk that was dangerously poised. The Pope, recognizing the timing and usefulness of that cry, gave Bresca and his progeny the privilege of providing the palms necessary for the commemoration of Palm Sunday every year to the Vatican. Since then various Bordighera families have honored the ancient privilege. Here we are at the final stage: the intertwining. Apparently the Benedictine Camaldolese nuns dedicated themselves to these exquisitely baroque works of art. Following their gradual abandonment, this activity was taken up by many craftsmen of the intertwining and personalized by them, so different works were created between one place and another; the Bordighera parmureli kept the style almost unaltered, producing new representative figures. 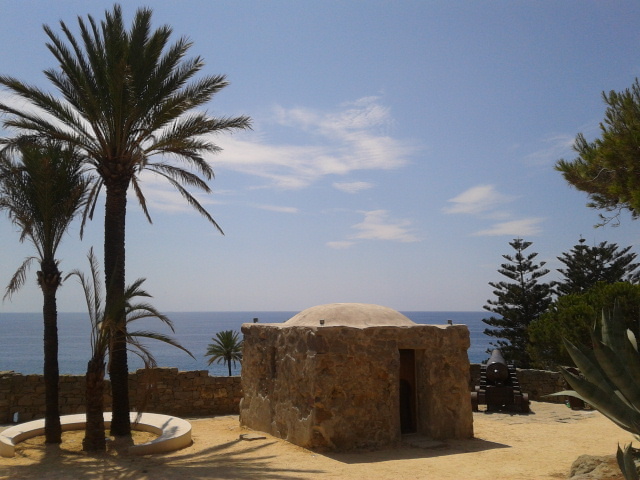 For centuries, the traditional cultivation of the palm tree has been one of the economic resources of the ancient Bordighera. 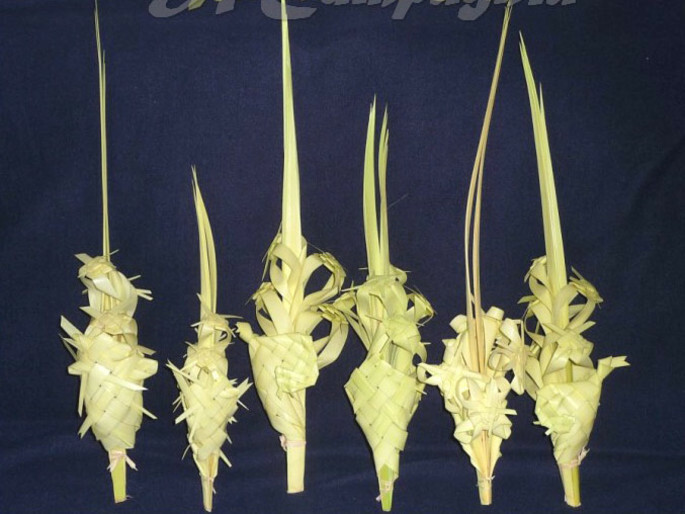 Its large sturdy leaves were tied with skill to make them clear, then they were cut and finally worked for the Catholic rite of Palm Sunday. The green branches were instead used for the feast of the Tabernacles of the Jews. Consider that in the past, from the early 1700s up to the early 1800s, there was a special Magistrate, commissioned by the auctioning of palm trees. The clear branches, worked with artistic weaves and figures by the people of the village, are the well-known "Parmureli", used for the solemn blessing of Palm Sunday. Until recently Bordighera maintained the secular privilege of providing the "white" palm branches to the Vatican each year for the celebration of the rite of Holy Week. In the last decades of the nineteenth century, the German botanist, but bordigotto of adoption, Lodovico Winter, promoted and increased the cultivation of palm trees in its nurseries; no longer only of dactylers, but also of other varieties such as the "Phoenix canariensis" (also used for "Parmureli", as the oldest dactylifera), "Washingtonia" and others. 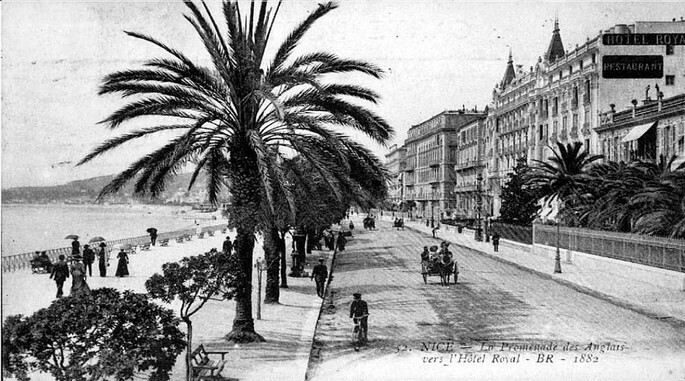 Countless palms were exported from Bordighera to the botanical greenhouses of Europe, the rest of the Riviera and the Cote d'Azur, where they still adorn gardens and avenues such as the Croisette in Cannes, the Promenade des Anglais in Nice, the gardens of the Principality of Monaco. Unfortunately some causes have impoverished over the years this botanical heritage typical of Bordighera, called precisely "City of Palms": the export of adult dactyl palm trees (from the late nineteenth century), the introduction of new flower crops in the 900 at the expense of palm plantations, post-war building expansion, diseases (red awl above all), neglect and abandonment of the countryside. To safeguard a centuries-old environmental characteristic and the tradition of the "Parmureli", it is necessary to provide without delay to save the Bordighera palms, especially the dactyliums found in characteristic groups spread out nicely in streets and gardens, or in more substantial palm groves. We remember the palms near the sea sung by the German poet Scheffel al Giunchetu, those of the former Winter Garden, at the Casa del Mattone, at Villa Donegani, at the Madonna della Ruota. Others overlooking the marina, at the Marabutto, on the Via Romana, in the garden of the Palazzo del Parco. But above all to save the residual secular palm groves that run along the Sasso Torrent, along the Beodo and the splendid, although downsized, Giardino Winter del Vallone, national monument, to be preserved and valued as a "family jewel" of the city.